The new BMW 6 series has a standard eight-speed automatic transmission supplied by ZF Friedrichshafen AG that provides additional gear ratios and an increased transmission ratio spread without any increase in size, weight or effect on the system's efficiency. The premium car, which is offered as a coupe or a convertible, gets its electric power steering and optional so-called "Integral Active Steering" from ZF Lenksysteme GmbH, a 50-50 joint venture between ZF and Robert Bosch GmbH. The Integral Active Steering can take control of the steering angle of the rear wheels using a concentrically designed motor with a spindle drive, increasing the car's maneuverability at low speeds. Preh GmbH of Germany provides the electronic control units for the active steering system. LuK (which is part of the Schaeffler Group of Germany) supplies the self-adjusting clutch system, including the dual mass flywheel and clutch discs. Bosch also supplies the direct injection system on both the 6 series' gasoline and diesel models. The jet-guided system has centrally positioned injectors between the valves, close to the spark plugs, allowing greater precision, helping increase the 6 series' acceleration while reducing fuel consumption. With a V-8 engine, the 6 series goes from zero to 100kph in 4.9 seconds. Bosch also supplies key components, such as the car's fuel-saving stop-start system and its dynamic stability controls. The 6 series is manufactured at BMW's plant in Dingolfing, southern Germany, on the L6 platform. 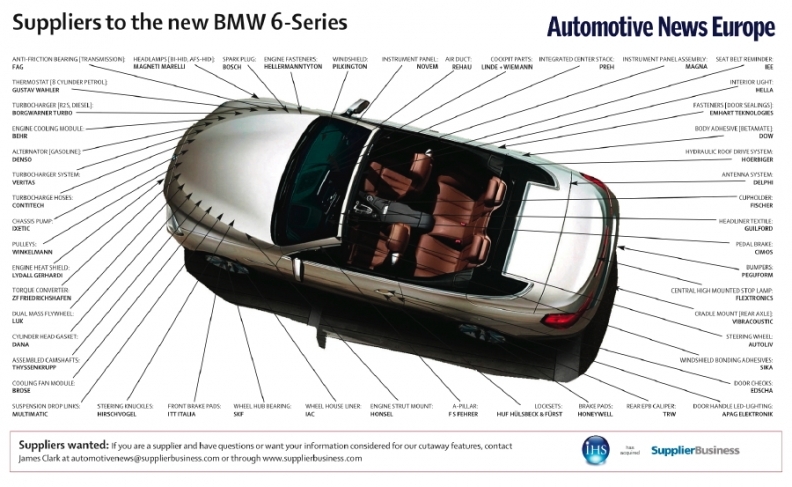 According to IHS Automotive forecasts, BMW will reach peak production of 18,000 6-series models in 2012, after which volumes will decline steadily.